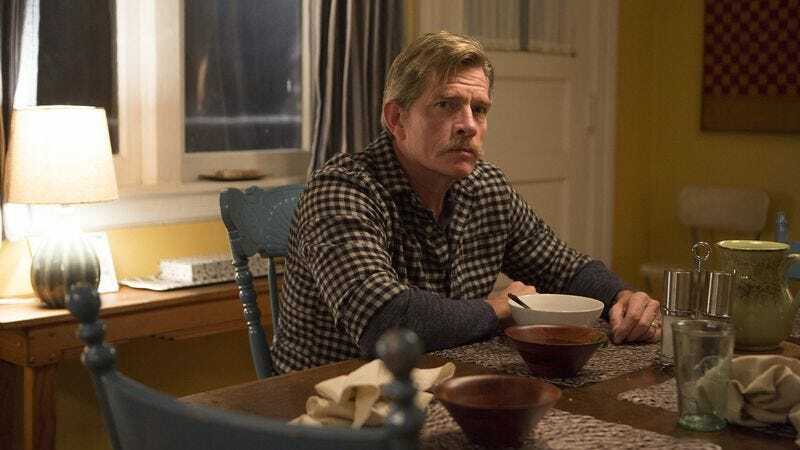 Consider the career of someone like Thomas Haden Church. Support player on a long-running sitcom like Wings, which he left after five years to head his own sitcom, the little-seen but exemplary Ned & Stacey. Probably made enough money doing voiceovers and animation work that he never needed to worry about appearing in front of the camera anyway. Then another iconic turn in an indie movie, as a womanizing actor in 2004’s Sideways. Over 10 years after that, in Divorce, Haden Church reinvents himself yet again. I gave him some kudos for his mic-drop ending speech last week, but I fear I wasn’t effusive enough. Haden Church is the heart of this entire series—not Sarah Jessica Parker, the wife who has wronged him. The whole concept of Divorce as a sitcom is a head-scratcher, because there’s hardly anything more grueling for an adult to endure (short of life-threatening illnesses or accidents involving family members). As Robert, Haden Church bolts head-long into the pain, so that we can’t help but cheer (and surprisingly, laugh) as pretends not to recognize his wife on the phone, or locks her out of the house. The fact that he ditches her purse in a garbage can, instead of locking her out entirely, shows that he still has a heart underneath all of his newly discovered venom (that’s the part that puts a banana peel on top of the purse). It’s the bone he throws her at the end of the episode, when he admits that if things had been going better in their marriage to begin with, Frances’ affair probably wouldn’t have happened. That’s a goddamn act of kindness that Frances barely deserves, a gesture that indicates absolute grace under pressure. By imbuing Robert’s revenge efforts with compassion, Haden Church, and Divorce, are able to solicit an awful lot of sympathy for someone with such an unfortunate mustache. It helps that Haden Church completely sells every act, no matter how outlandish, pretending to have conversations at work while on the phone with Frances, or storming past his wife and her friends to visit Nick, who we saw having a heart attack last episode. That incident was definitely over the top, maybe in a way that was harder to watch than it should have been. Divorce’s second episode brings everything back down to a recognizable domestic level: What does happen the day after your husband finds out about your affair and tells you he wants a divorce? There’s another nice symmetry at play when we realize that this episode, like the last, takes place over an approximate 24-hour period or so. Frances and Robert end the day finally in the same space, their bedroom, an appropriate place for such an intimate conversation about the possible future of their marriage. Again, Frances’ pleas that she loves Robert fail to convince him or us: Is it just this carefully manufactured suburban life she’s crafted that she’s clinging to? The title of the series almost serves as a spoiler, as we’re pretty sure what’s coming. But that doesn’t mean that it doesn’t resonate, especially when we see it from Robert’s side, as Haden Church somehow layers actual humor on top of his rage and compassion to give us about the only person on this series we can unequivocally root for. He’s so good at it, actually, it makes us almost gleefully anticipate what’s going to happen as this Divorce gets uglier, as it inevitably will. Remember Keith’s annoying little sister in Some Kind Of Wonderful? That’s Maddie Corman as Frances’ frustrated realtor Carla. For a second episode, Divorce seems to be missing some steps: Frances called in to work the previous day with some personal problems, and the next day she’s renting an art gallery? Within the next few episodes we’ll find out that she’s an executive recruiter with this artistic bent, but that kind of information would have been helpful earlier on. The lawyer associate in the hospital room was a nice touch. Another stellar delivery: Robert telling Diane to get her gun tote off of Nick’s colostomy bag. Frances removing the spoon from the dining room table was also an effective, to-the-point gesture. The song selection on this show remains above par, kicking off with Little River Band’s “Reminiscing” from 1978, closing with the more recent Richard Hawley’s “Baby You’re My Light” as Robert Googles “Julian Columbia Professor Granola” and comes up with an instant hit.